This is the second volume in a complete chronological survey of the Clementi sonatas which we hope to complete in six ’2 for the price of 1’ double CD sets released over the next three years. After the somewhat frivolous delights of Volume 1, Volume 2 displays Clementi in more serious and weighty form. The selection recorded here, particularly the Op 12 sonatas, is of pieces that begin to reveal depths of expression seldom encountered in the composer’s earlier music. Muzio Clementi was for much of his long career one of the most famous musicians in Europe. Around the turn of the nineteenth century his public esteem was probably second only to that of Haydn, and, a decade or so later, Beethoven. But unlike the reputations of these other two, Clementi’s fame as a musician rested almost solely upon his exploits, as both player and composer, at a single instrument, the piano. And the vast majority of his compositions are sonatas for that instrument. This is a fascinating body of work which spans European musical life from Scarlatti to Chopin. For many present-day music lovers the name Muzio Clementi probably evokes little but bitter-sweet memories of certain inevitable Sonatinas practised year in, year out, by virtually every beginner piano student in the Western world. The Sonatinas in question are those of Opus 36, composed expressly for the purpose for which they have proved so enduringly useful. But in his own day Clementi’s reputation was quite different; particularly during the period around 1785 to 1800 he was famous throughout Europe as a virtuoso performer, and a composer of music for piano on the cutting edge of musical style—to which the present set of recordings bears witness. 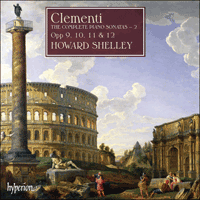 Clementi was born in 1752 in Rome, where he received his earliest musical education. Then at the age of thirteen he moved to England, and made his home there for the remainder of his life, first as a teenager in Dorset, thereafter in London, and at the very end in Lichfield (Staffordshire) and Evesham (Worcestershire), where he died at the age of eighty in 1832. After about 1800 Clementi was one of the most prominent music teachers in London, and also very active as a music publisher and piano manufacturer; his firm, Clementi and Co. (with additional names reflecting the coming and going of various partners) operated at a London Cheapside address from 1798 until his retirement in 1830. In the summer of 1780 Clementi set off on a tour of the European continent that took him to Paris, where he remained for a year, and thereafter, via several German cities, to Vienna. After a four-month stay there he evidently spent some months teaching and playing in Lyon before returning to London. All of the music included in the present volume Clementi composed during or just prior to this trip, and some of it he clearly performed in the cities along the way. Clementi evidently composed the six sonatas of Opp 9 and 10 in Vienna, where they were quickly put out by the local music publisher Artaria during or just after his stay in that city. All but one of these sonatas is in three movements, as was the fashion in Vienna; only the second sonata of Op 10 (Maestoso—Presto) is in the two-movement Italianate format of Clementi’s past. In these sonatas he shows a heightened interest in movements of the sonata-allegro type, the characteristic shape of first movements of all the composers of this period. The sonata-allegro structure stresses the development of a small amount of musical material and the interplay of stable and unstable tonal areas, a format that in Clementi’s time suggested a certain weight and seriousness. The formal principle of rondos, commonly used in finales, depends upon literal repetition and a juxtaposition of unlike materials associated with a kind of folk-like jollity. Four out of the six finales in Opp 9 and 10, like all the first movements, are cast in sonata-allegro form. And even the two rondos among them (the finales of Op 9 Nos 1 and 2) have a certain heft and gravity not often associated with the genre. The rondo-finale of Op 9 No 2 features a plangent minore episode cast in what eighteenth-century musicians called tempo rubato; that is, the melodic notes are systematically offset so as to fall on the off-beat—an effect that connoted sorrow or lamentation. In one of the sonata-form finales—the lightning-like moto perpetuo of Op 10 No 1 in A major (a movement that retains distinct traces of Clementi’s Italian past and the sonatas of Domenico Scarlatti)—the second half lingers long and quietly in the distant key of C sharp minor before bursting back into the brilliant A major of the foreshortened recapitulation. And in the sonata-allegro finale of Op 10 No 2 in D major, Clementi engages in the sort of restless formal experiment that marks a good deal of his music from this period. This movement has a ‘subdominant recapitulation’, in which the return in the second half of the piece occurs in the ‘wrong’ key, G major. (One can easily hear this when, towards the end of the movement, the ebullient opening theme, rising through a full two octaves, appears again but beginning at a surprisingly low pitch.) This stratagem, together with the readjustment of the tonal bearings it entails for the rest of the movement, reappears shortly after this time in the first movement of Mozart’s famous Sonata in C major K545. One composition Clementi tells us he played at this contest was the Sonata in B flat major, Op 24 No 2, whose opening theme much resembles the beginning of Mozart’s later overture to The Magic Flute. Another is his Toccata from Op 11. The first and last sections of this piece feature long passages of those notoriously difficult parallel thirds, marked, true to Mozart’s characterization, Prestissimo, alla breve. This is a composition that belongs to what Clementi later referred to as his initial ‘virtuoso’ phase. We do not know what the Emperor or his Russian guests thought of this kind of technical wizardry, but Mozart was little impressed. At the time of the contest Clementi almost surely had available some of the more mature and expressive music of Opp 7 and 8 (see volume 1 of this survey); it would be interesting to know how Mozart might have reacted to this. At least some movements of the four sonatas of Op 12 were also finished by the time of the Viennese sojourn. Some of this music reverts to the triadic and ‘murky bass’ (i.e. broken-octave) accompanimental formulas that recall Clementi’s writing as early as Op 2, and all but one of these sonatas again have rondos as final movements. The finale of the first sonata is a charming set of variations on ‘Je suis Lindor’, Antoine-Laurent Baudron’s setting of the romanze from Beaumarchais’ Barbier de Séville. Here ornamental runs of even semiquavers (sixteenth-notes) mix with Clementi’s well known specialities such as passages in thirds and broken octaves to produce a convincing result—such techniques somehow seem rather at home in variations. Mozart also wrote an unpretentious set of variations on this tune (K354); this time his composition (written in 1778) came first. Perhaps the most surprising aspect of the sonatas of Op 12 are the slow movements. All four of them are deeply serious pieces that aim for depths of expression seldom encountered in the composer’s earlier music. Far-flung harmonies, including generous use of that favorite agent of harmonic obfuscation of the early nineteenth century, the diminished seventh chord, add to an impression of impassioned pathos. Sometimes all this emotion seems terse and controlled, as in the remarkably laconic Largo of the second sonata; or it can be given more space to play out as in the ambitious and eloquent (at points perhaps merging on the grandiloquent) Lento of the fourth. In a retrospective statement of 1806 that reaches us through his student Ludwig Berger, Clementi seemed to acknowledge that Mozart’s excoriation of his early ‘virtuoso’ manner was not entirely unjust; according to Berger, Clementi recalled that ‘in his earlier period he had taken particular delight in brilliant feats of technical proficiency, especially in those passages in double notes that were not common before his time, and in improvised cadenzas. It was only later that he adopted a more melodic and noble style of performance.’ The slow movements of the Op 12 sonatas are a good example of this ‘more melodic and noble style’. Pour bien des mélomanes, le nom de Muzio Clementi n’évoque probablement guère plus que le souvenir doux-amer de certaines Sonatines incontournables travaillées, année après année, par presque tous les apprentis pianistes occidentaux. Ces Sonatines, ce sont celles de l’op. 36, composées expressément aux fins pour lesquelles elles se sont révélées d’une si durable utilité. Mais Clementi, en son temps, jouissait d’une toute autre réputation: dans les années 1785– 1800, notamment, c’était un pianiste virtuose célèbre dans toute l’Europe et un compositeur à la pointe du style pianistique—comme en témoigne la présente série d’enregistrements. Né en 1752 à Rome, où il reçut sa toute première formation musicale, Clementi s’installa définitivement en Angleterre à l’âge de treize ans, passant son adolescence dans le Dorset avant d’emménager à Londres puis, sur sa toute fin, à Lichfield (Staffordshire) et à Evesham (Worcestershire), où il mourut octogénaire, en 1832. Après 1800, il compta parmi les professeurs de musique les plus éminents de Londres, mais fut aussi un éditeur de musique et un fabricant de pianos très actif—de 1798 à sa retraite, en 1830, sa firme Clementi & Co. (le second nom variant selon les allers et venues des divers associés) fonctionna à Londres (Cheapside). À été de 1780, Clementi entreprit un tour de l’Europe qui le conduisit à Paris, où il résida un an, puis, via plusieurs cités allemandes, à Vienne, pour une durée de quatre mois. Après quoi il passa manifestement plusieurs mois à Lyon, à enseigner et à jouer, avant de rentrer à Londres. Toutes les pièces du présent volume furent composées juste avant ou pendant ce périple, certaines ayant apparemment été jouées dans les villes rencontrées en chemin. Les six sonates des opp. 9 et 10 semblent avoir été écrites à Vienne, où l’éditeur Artaria les publia sans délai (pendant ou juste après le séjour de Clementi). Toutes, sauf une, sont à la mode viennoise, en trois mouvements, la deuxième sonate de l’op. 10 (Maestoso–Presto) étant la seule à adopter le format en deux mouvements, vestige italianisant du passé du compositeur, lequel s’intéresse ici davantage aux mouvements de type allegro de sonate, la forme alors caractéristique de tous les premiers mouvements. Structurellement, l’allegro de sonate insiste sur le développement d’une petite quantité de matériel musical et sur le jeu entre les régions tonales stables et instables—un format qui, à l’époque, dénotait un certain poids, une certaine gravité. Quant aux rondos, souvent utilisés dans les finales, ils ont pour principes formels la répétition littérale et la juxtaposition de matériaux contraires, avec une sorte d’entrain populaire. Comme les premiers mouvements, quatre des six finales des opp. 9 et 10 ont la forme d’un allegro de sonate. Et il n’est pas jusqu’aux deux rondos (les finales des nos 1 et 2 de l’op. 9) qui ne présentent un certain côté pesant et solennel, rarement associé à ce genre. Le finale-rondo de l’op. 9 no 2 recèle un plaintif épisode minore coulé dans ce que les musiciens du XVIIIe siècle appelaient un tempo rubato: les notes mélodiques sont systématiquement décalées pour tomber sur un temps faible (un effet vecteur de tristesse ou de lamentation). Dans l’un des finales de forme sonate—le fulgurant moto perpetuo de l’op. 10 no 1 en la majeur (un mouvement empreint de traces visibles du passé italien de Clementi et des sonates de Domenico Scarlatti)—, la seconde moitié traîne paisiblement en longueur dans la tonalité éloignée d’ut dièse mineur avant de revenir en force dans le brillant la majeur de la réexposition condensée. Dans le finale en allegro de sonate de l’op. 10 no 2 en ré majeur, Clementi se livre à cette sorte de nerveuse expérimentation formelle qui marque une bonne part de sa musique de l’époque. Ce mouvement a une «réexposition à la sous-dominante», où la reprise, dans la seconde moitié de la pièce, se fait dans la «fausse» tonalité de sol majeur. (On l’entend bien quand, vers la fin du mouvement, le bouillonnant thème initial, s’élevant via deux octaves complètes, réapparaît, mais en commençant à une hauteur de son étonnamment basse.) Ce stratagème, associé au réajustement des relations tonales qu’il induit pour le reste du mouvement, refera bientôt surface dans le premier mouvement de la fameuse Sonate en ut majeur, K545 de Mozart. Lors de cette joute, Clementi nous dit avoir joué, entre autres, sa Sonate en si bémol majeur, op. 24 no 2—dont le thème liminaire ressemble beaucoup au début de l’ouverture que Mozart écrira plus tard pour La flûte enchantée—et la Toccata de son op. 11. La première et la dernière sections de cette pièce renferment de longs passages de ces tierces parallèles notoirement difficiles, marqués (comme l’avait constaté Mozart) Prestissimo, alla breve. Cette œuvre appartient à ce que Clementi appellera sa phase initiale «virtuose». Nous ignorons ce que l’empereur et ses hôtes russes pensèrent de cette sorcellerie technique mais Mozart, lui, ne fut guère impressionné. Au moment de la joute, Clementi disposait très certainement déjà de quelques épisodes, plus aboutis et expressifs, des opp. 7 et 8 (cf. vol. 1 de notre anthologie), et il serait intéressant de savoir comment Mozart y eût réagi. De même, quelques mouvements au moins des quatre sonates de l’op. 12 étaient achevés à l’époque du séjour viennois de Clementi. Certaines pages de cette musique reviennent aux formules d’accompagnement avec accords parfaits et «basses murky» (i.e. octaves arpégées) rappelant l’écriture de l’op. 2 et seule une de ces sonates n’a pas de rondo en guise de mouvement terminal. Le finale de la première sonate est une charmante série de variations sur «Je suis Lindor», la romance du Barbier de Séville de Beaumarchais mise en musique par Antoine-Laurent Baudron. Ici, les passages rapides décoratifs, y compris de doubles croches, se mêlent aux célèbres spécialités clementiniennes, comme les passages en tierces et en octaves arpégées, pour produire un résultat convaincant—des techniques qui ne paraissent pas vraiment incongrues dans des variations. Mozart, lui aussi, écrivit une série de variations sans prétention sur cet air (K354), mais avant Clementi, cette fois (1778). C’est peut-être par leurs mouvements lents que ces sonates de l’op. 12 surprennent le plus. Tous quatre sont des morceaux très sérieux visant à des profondeurs expressives encore rares chez Clementi. Des harmonies étendues—usant généreusement de cet agent d’obscurcissement harmonique cher au début du XIXe siècle qu’est l’accord de septième diminuée—ajoutent à l’impression de pathos fervent. Tantôt toute cette émotion semble succincte et contrôlée, comme dans le Largo remarquablement laconique de la deuxième sonate; tantôt on lui octroie plus d’espace pour s’exprimer, comme dans l’ambitieux et éloquent (voire, par endroits, grandiloquent) Lento de la quatrième. Dans une déclaration de 1806, que nous connaissons par son élève Ludwig Berger, Clementi reconnut, semble-t-il, que la condamnation mozartienne n’était pas totalement infondée. Selon Berger, il admit que «par le passé, il s’était complu dans les brillantes prouesses de maîtrise technique, notamment dans ces passages en doubles notes, rares avant lui, et dans les cadenzas improvisées. Ce fut seulement plus tard qu’il adopta un style d’exécution plus mélodique, plus noble»—un style qu’illustrent bien les mouvements lents des sonates de l’op. 12. Für viele heutige Musikliebhaber bedeutet der Name Muzio Clementi wohl kaum mehr als bittersüße Erinnerungen an gewisse unvermeidliche Sonatinen, die jahrein, jahraus von praktisch jedem Klavieranfänger in der westlichen Welt geübt werden müssen. Es handelt sich um die ausdrücklich für diesen Zweck komponierten Sonaten op. 36, die sich so dauerhaft als nützlich erwiesen haben. Aber zu Lebzeiten hatte Clementi einen ganz anderen Ruf, besonders in der Periode um 1785–1800, als er europaweit als Klaviervirtuose und Komponist von bahnbrechender Klaviermusik auf dem neuesten Stand des musikalischen Stils berühmt war—die vorliegenden Aufnahmen sind Zeuge dafür. Clementi wurde 1752 in Rom geboren, wo er auch seine früheste musikalische Ausbildung erhielt. Im Alter von dreizehn ging er nach England, das er für den Rest seines Lebens zu seiner Heimat machte. Als Jugendlicher lebte er zunächst in Dorset, dann London und am Ende seines Lebens in Lichfield (Staffordshire) und Evesham (Worcestershire), wo er 1832 im Alter von achtzig starb. Ab etwa 1800 war Clementi einer der berühmtesten Klavierlehrer in London und auch als Musikverleger und Klavierhersteller sehr aktiv; seine Firma Clementi and Co. (mit zusätzlichen Namen, als verschiedene Partner kamen und gingen) war von 1798 bis zu seiner Zurruhesetzung 1830 mit einer Adresse in Cheapside in London im Betrieb. Im Sommer 1780 unternahm Clementi eine Europareise, die ihn zunächst nach Paris führte, wo er ein Jahr blieb, und später über mehrere deutsche Städte nach Wien. Nach einem viermonatigen Aufenthalt dort, verbrachte er anscheinend einige Monate mit Unterrichten und Spielen in Lyon, bevor er nach London zurückkehrte. Clementi komponierte alle Musik im vorliegenden Band während oder kurz vor dieser Reise und führte offensichtlich viel davon in den Städten auf seinem Wege auf. Die Sonaten op. 9 und 10 komponierte Clementi scheinbar in Wien, wo sie während oder kurz nach seinem Aufenthalt in der Stadt schnell von dem ortsansässigen Musikverleger Artaria herausgegeben wurde. Alle Sonaten stehen in drei Sätzen, wie es in Wien Mode war, außer der zweiten Sonate von op. 10 (Maestoso–Presto) im zweisätzigen italienischen Format aus Clementis Vergangenheit. In diesen Sonaten zeigt er ein größeres Interesse an Sätzen vom Sonatenallegro-Typ, dem charakteristischen Muster für Hauptsätze bei allen Komponisten dieser Periode. Die Sonaten-Struktur betont die Durchführung eines kleinen Teils musikalischen Materials und das Wechselspiel zwischen stabilen und instabilen Tonzentren, ein Format, das zu Clementis Zeit eine gewisse Gewichtigkeit und Seriosität andeutete. Die Formprinzipien des Rondos, das gewöhnlich für die Finales verwendet wurde, verlassen sich auf buchstäbliche Wiederholung und die Gegenüberstellung unähnlichen Materials mit einer Art volkstümlicher Fröhlichkeit. Vier der sechs Finales in op. 9 und 10 sind in Sonatenform gehalten. Und selbst die beiden Rondos unter ihnen (die Finales von op. 9 Nr. 1 und 2) besitzen ein gewisses Gewicht und Gravität, die nicht oft mit dem Genre assoziiert werden. Das Rondofinale von op. 9 Nr. 2 besitzt eine klagevolle minore Episode im von Musikern des 18. Jahrhunderts sogenannten tempo rubato; das heißt, die Melodienoten werden systematisch verschoben, so dass sie auf unbetonte Taktschläge fallen—ein Effekt, der Kummer oder Klage implizierte. In einem der Sonatenform-Finales—dem blitzhaften moto perpetuo von op. 10 Nr. 1 in A-Dur (einem Satz, der deutliche Züge aus Clementis italienischer Vergangenheit und den Sonaten von Domenico Scarlatti trägt)—verharrt die zweite Hälfte lange und verhalten in der entfernten Tonart cis-Moll bevor sie für die verkürzte Reprise wieder in brillantes A-Dur ausbricht. Und im Sonatenform-Finale von op. 10 Nr. 2 in D-Dur, befasst Clementi sich mit der Art rastlosen formalen Experimentierens, das einen Großteil seiner Musik aus dieser Periode auszeichnet. Dieser Satz hat eine „Subdominant-Reprise“, die in der zweiten Hälfte des Stückes in der „falschen“ Tonart G-Dur erscheint. (Dies ist leicht zu hören wenn das überschwängliche, durch zwei Oktaven aufsteigende Anfangsthema gegen Ende des Satzes wiederkehrt, aber überraschend tief beginnt.) Dieser Kniff, zusammen mit der Neuverteilung der tonalen Orientierung, die er für den Rest des Satzes mit sich bringt, erscheint kurze Zeit später im ersten Satz von Mozarts berühmter Sonate in C-Dur K545 wieder. Clementi kam am Heiligabend 1781 in Wien an. Er hatte kaum Zeit zum Auspacken, bevor er zum Hof bestellt wurde, um am gleichen Abend für den Kaiser und seine Gäste, Großherzog Paul und die Großherzogin von Russland, zu spielen. Was ihm nicht mitgeteilt wurde, war, dass ein berühmter lokaler Pianist, Wolfgang Amadeus Mozart, ebenfalls eingeladen war—die Idee war, dass die beiden eine Art Klavierwettbewerb abhalten sollten, was für beie Musiker eine Überraschung war. Jeder improvisierte und führte eigene Kompositionen auf, und danach spielten sie zusammen auf zwei Klavieren. Obwohl kein Sieger erklärt wurde, äußerte sich Mozart später über Clementis Spiel unerbittlich kritisch und schrieb kurz nach dem Abend an seinen Vater: „Clementi … ist ein braver Cembalist … Er hat sehr viele Fertigkeit in der rechten Hand, seine Hauptpassagen sind die Terzen.—Übrigens hat er um keinen Kreuzer Geschmack noch Empfindung.—Ein bloßer Mechanicus.“ Achtzehn Monate später fügte er hinzu, dass man, wenn mann Sexten und Oktaven mit äußerster Geschwindigkeit spielt (was niemand kann, nicht einmal Clementi) nur eine scheusslich gehackte Wirkung erzielt, nichts sonst … [Clementi] schreibe Presto über eine Sonate oder sogar Prestissimo und Alla breve und spiele sie selbst Allegro im 4/4-Takt. Er [Mozart] wisse das, weil er ihn gehört hätte. Eine Komposition, die Clementi laut seines eigenen Berichts in diesem Wettstreit spielte, war die Sonate op. 24 Nr. 2, deren Anfangsthema dem Beginn der späteren Ouvertüre zu Mozarts Zauberflöte ganz ähnlich ist. Eine andere war die Toccata aus op. 11. Der erste und letzte Abschnitt dieses Stückes weist lange Passagen jener notorisch schwierigen Terzparallelen auf, die wie in Mozarts Beschreibung mit Prestissimo, alla breve überschrieben sind. Diese Komposition gehört zu seiner frühen „Virtuosen“-Phase, wie Clementi sie später bezeichnete. Wir wissen nicht, was der Kaiser oder seine russischen Gäste von solch technischer Zauberei hielten, aber Mozart war wenig beeindruckt. Zur Zeit des Wettstreits hatte Clementi sicherlich bereits einige der reiferen, expressiven Musik aus op. 7 und 8 (siehe Band 1 unserer Übersicht) verfügbar; es wäre interessant, wenn wir wüssten, wie Mozart auf diese reagierte hätte. Zumindest einige Sätze der vier Sonaten op. 12 waren zur Zeit des Wiener Aufenthalts bereits fertig. Ein Teil dieser Musik kehrt zu den Begleitformeln von Dreiklang und „Murky-Bass“ (gebrochene Oktaven) zurück, die an Clementis frühes Schreiben (bis zurück zu op. 2) erinnern, und mit einer Ausnahme haben alle diese Sonaten wiederum Rondos als Schlussätze. Das Finale der ersten Sonate ist eine bezaubernde Variationenfolge über „Je suis Lindor“, Antoine-Laurent Baudrons Vertonung der Romanze aus Beaumarchais’ Barbier de Séville. Hier werden zierreiche Sechzehntelläufe mit Clementis wohl bekanntenSpezialitäten wie Passagen in Terzen und gebrochenen Oktaven vermischt, um überzeugende Resultate zu erzeugen—solche Techniken scheinen in Variationen zu Hause zu sein. Mozart schrieb ebenfalls bescheidene Variationen über diese Melodie (K354), aber diesmal kam seine (1778 geschriebene) Komposition zuerst. Der überraschendste Aspekt der Sonaten op. 12 sind womöglich die langsamen Sätze. Alle vier sind sehr seriöse Stücke, die sich um eine Ausdruckstiefe bemühen, wie sie sich in der früheren Musik des Komponisten selten findet. Weit ausgreifende Harmonik, einschließlich großzügigen Gebrauchs des verminderten Septimakkords, dem Lieblingsagenten harmonischer Verwischung im frühen 19. Jahrhundert, tragen zum Eindruck von leidenschaftlichem Pathos bei. All diese Emotion scheint manchmal prägnant und kontrolliert wie im bemerkenswert lakonischen Largo der zweiten Sonate, oder kann mehr Spielraum erhalten wie im ehrgeizigen und eloquenten (bisweilen vielleicht übertriebenen) Lento der vierten. In einem nachträglichen Bericht von 1806, der uns über seinen Studenten Ludwig Berger überliefert ist, scheint Clementi zuzugeben, dass Mozarts bissige Bemerkungen über seine frühe „Virtuosen“-Manier nicht ganz unberechtigt waren und erinnert sich, laut Berger, dass er sich „in jener früheren Zeit vorzugsweise noch in grosser brillirender Fertigkeit und besonders in denen vor ihm nicht gebräuchlich gewesenen Doppelgriff-Passagen und extemporirten Ausführungen gefallen, und erst spätter den gesangvollern, edlern Styl im Vortrage … sich angeeignet habe“. Die langsamen Sätze der Sonaten op. 12 sind gute Beispiele für diesen „gesangvollern, edlern Styl“.